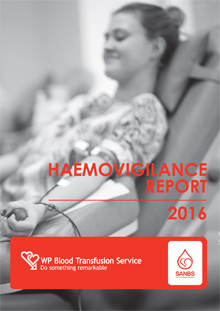 Haemovigilance is a surveillance system that focuses on improvement of processes and procedures and prevention of the recurrence of transfusion related reactions. This is achieved by continuous collection and analysis of data on reactions related to the transfusion of blood products. 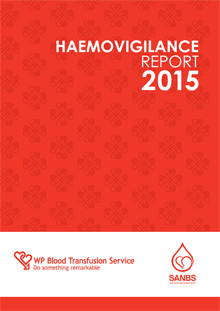 Haemovigilance is an integral part of providing a safe blood supply to all patients of South Africa. It is important to note that Haemovigilance can only contribute if there is a comprehensive quality system in place, based on principles of current good manufacturing, Laboratory and Clinical (Hospital) practice. The success of the programme in contributing to safe blood supply depends on cooperation from all stakeholders and reporting of all possible transfusion reactions accurately and timeously. 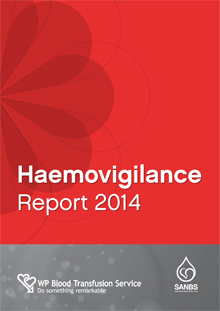 The table below provides necessary Haemovigilance reports and an additional information leaflet on Haemovigilance. The main purpose of the guide is to educate nurses and other health care professionals on the appropriate use and handling of blood and blood products. 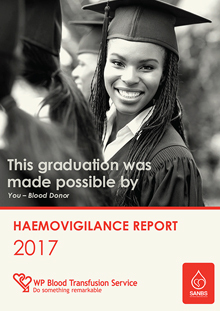 The Clinical Guidelines are intended for medical personnel in South Africa who need to order blood or blood products from South African National Blood Service (SANBS).